February 21, 2012 - Capt Ryan P. Hall from the 319th Special Operations Squadron, Capt Nicholas S. Whitlock and 1st Lt Justin J. Wilkens from the 34th Special Operations Squadron and Senior Airman Julian S. Scholten from the 25th Intelligence Squadron died February 18 when their U-28A was involved in an accident near Camp Lemonnier, Djibouti, located in the Horn of Africa. No other personnel were on board the aircraft. The U-28 was returning from a mission in support of Operation Enduring Freedom. The Pilatus PC-12 is a single-engine turboprop passenger and cargo aircraft manufactured by Pilatus Aircraft of Switzerland. The main market for the aircraft is corporate transport and regional airliner operators. The US Air Force's designation is the U-28A. Captain Hall, 30, was a U-28A pilot on his seventh deployment. He entered the Air Force in 2004, receiving his commission through the Reserve Officer Training Corp at The Citadel. He had been assigned to the 319th SOS at Hurlburt Field since 2007 and had more than 1,300 combat flight hours. Captain Whitlock, 29, was also a U-28A pilot and was on his fifth deployment. He entered the Air Force in 2006, receiving his commission through the Officer Training School. He had been assigned to the 319th SOS and then to the 34th SOS at Hurlburt Field since 2008 and had more than 800 combat flight hours. Lieutenant Wilkens, 26, was a combat systems officer on his third deployment. He entered the Air Force in 2009, receiving his commission through the Air Force Academy. He had been assigned to the 34th SOS at Hurlburt Field since April 2011 and had more than 400 combat hours. Airman Scholten, 26, was a mission systems operator assigned to the 25th IS at Hurlburt Field since 2009. He enlisted in the Air Force in 2007. He had more than 600 combat hours in six different airframes and was on his third deployment. "The Hurlburt Field community expresses our deepest condolences to the family of the crew, and we share in their sorrow. Our efforts are focused on helping them through this difficult time," said Col. Jim Slife, commander of the 1st Special Operations Wing. "We will never forget the valuable contributions these brave men made to their country and community." 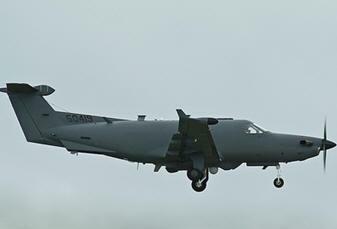 The U-28A is a single engine, manned fixed wing aircraft developed around the Pilatus PC-12 airframe that provides intelligence, surveillance and reconnaissance capabilities in support of special operations forces. The cause of the crash is unknown at this time. The Air Force is committed to a thorough investigation, and more information will be released as it becomes available.